For about the cost of a pizza each month, a renters insurance policy could protect your earthly possessions and spare you legal or medical expenses if someone is injured in your home. And yet, there’s an excellent chance you don’t carry it. Although 95 percent of people who own homes carry homeowners insurance, only 41 percent of renters have renters insurance, according to the Insurance Information Institute, which put the annual cost of a policy at an average of $188 in 2015. One reason for the disparity is that mortgage lenders often require homeowners to carry insurance on a property they’re financing, while there is usually no such equivalency when leasing a property owned by someone else. But just because no one is making renters buy insurance, is that actually a reason not to? Unfortunately, the value of insurance often eludes us until we need it. Here are some things to consider if you’re debating whether renters insurance is right for you: 1. How valuable are your belongings? There’s a good chance you would weep harder if an airline lost your suitcase containing all your favorite clothes than if something wrecked your thrift store sofa. But what about a fire that comes along and destroys your apartment, wiping out all of your belongings and leaving you with ash and rubble? How much would it cost you to replace everything you lost? Most people think only of their big-ticket items like electronics and furniture. But the average renter owns $30,000 worth of possessions, according to Allstate. When you add up the value of all of your stuff, you may find that you would not be financially able to replace everything at once. Generally speaking, the older you are, the more possessions you’ve acquired. So take stock of what you have. And while you’re logging your inventory, take photos of the big-ticket items and consider using a home inventory app. Should a fire actually occur, having a digital record will ease the claim-filing process. 2. What exactly will a renters policy cover that isn’t covered by your landlord’s insurance? Plenty. 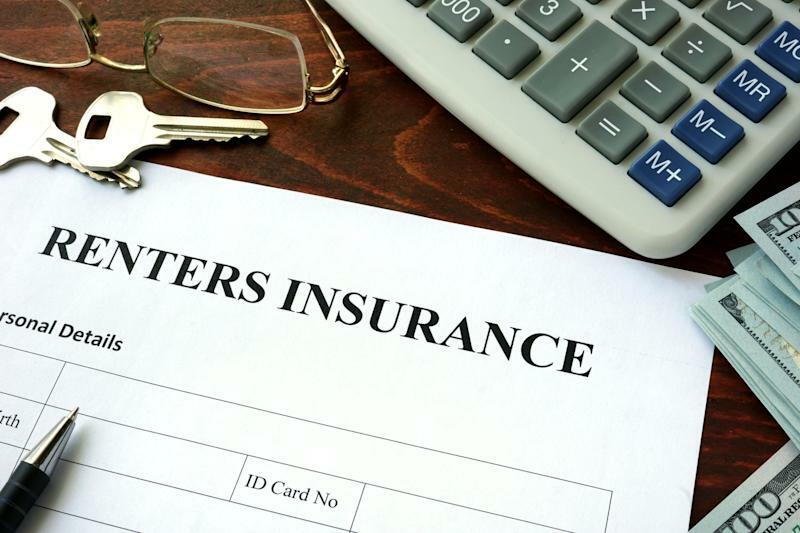 Generally speaking, renters insurance covers you against losses from fire or smoke, lightning, vandalism, theft, explosion, windstorm and certain types of water damage (such as from a burst pipe, or when the tenant upstairs leaves the bathtub running and floods your apartment). Most renters insurance policies do not cover floods or earthquakes. Flood coverage is available from the National Flood Insurance Program and a few private insurers. You can get earthquake insurance as a separate policy or have it added as an addendum to your renters policy, depending on where you live. And don’t look to your landlord’s policy to cover your personal losses. The landlord’s insurance will probably cover replacing a window broken by a burglar, but it will not cover the laptop and TV the burglar stole. Your landlord’s insurance will cover the physical structure of the building ― say, if a tree falls on the roof. A renter’s policy wouldn’t cover the roof repair, but it would cover any damage that the collapsed roof caused to your personal belongings. 3. What is an actual cash value policy, and is that the kind of insurance you need? An actual cash value policy means that insurance will cover the actual current value of your items. So the Mac laptop you bought new in 2015 for $1,500 will be replaced not at $1,500, but at whatever its value is today. And there’s a very good chance that amount won’t be enough to replace it new. However, you can ask for a replacement cost value insurance policy, which would cover the cost of repairing or replacing your belongings at as-new prices. If a leak from your neighbor’s broken pipe destroys your couch, insurance would allow you to buy a new couch, rather than just paying you the depreciated value of your current, damaged couch. Because replacement cost value policies pay out more, they also cost more. 4. Will a renters policy cover everything? Not hardly. Your policy may have an overall ceiling on the total amount it will pay out per claim, and may also set limits on individual categories of loss. For example, there may be a cap on jewelry. If that’s the case and Grandma’s diamond ring is stolen from your apartment, your policy may limit your claim to $1,000, even though the ring was valued at $3,000. The way to get around these limits is to have a personal property endorsement for extra coverage on an item. And yes, that will cost more. Confusion may be the biggest problem with renters insurance. Between different exclusions and limits, it can be hard to figure out what’s covered. And who wants to pay money for something they don’t understand? Go over your contract with your insurance agent and ask questions. Put the ball in their court, and ask them why you need renters insurance; let them spell out various scenarios. And if you have particular concerns ― are you covered if your iPhone goes for a swim in the toilet? ― raise them. 5. Do you really need coverage for additional living expenses? When an event or natural disaster makes your apartment unlivable ― even for just a few days ― will you have another place to stay, or will you need to head to the nearest motel? Many renters insurance policies cover your housing expenses if you are displaced. Keep in mind that staying in a hotel for more than one night may cost more than your annual renters insurance premium. Plus, not all your friends will welcome you if you have pets, and the couch in your mom’s house was never really all that comfortable anyway. 6. Why would a renter need to carry liability insurance? Because, quite simply, you are liable and you don’t want to be on the hook for legal or medical bills if someone injures themselves in your apartment. Basic liability and medical payment coverage is standard in most renters insurance policies, which means when your cat leaves a gash on your soon-to-be-ex’s face, you are covered. You are also covered when your friend slips and falls on your rug. 7. What’s the alternative? The only alternative to having a renters policy is to not have one! That means you’d better be prepared to handle losses on your own if something happens. Some people manage by putting aside a little each week for an emergency fund, should they ever need to replace or repair their belongings. The problem with that is you likely wouldn’t have enough saved to replace everything all at once: A 2016 Federal Reserve study found that half of Americans don’t have enough savings to cover a $400 emergency. There is some psychology involved in insurance. Most people don’t want to feel they are wasting money, and there is no tangible reward for carrying insurance unless you use it. So it really comes down to this: Is your peace of mind worth 50 cents a day? That’s about what a policy will cost.